The Military Gallery calendars have quickly become essential for all Aviation and Military enthusiasts. Each calendar features twelve outstanding paintings, specially selected from the Military Gallery’s unrivaled archives. 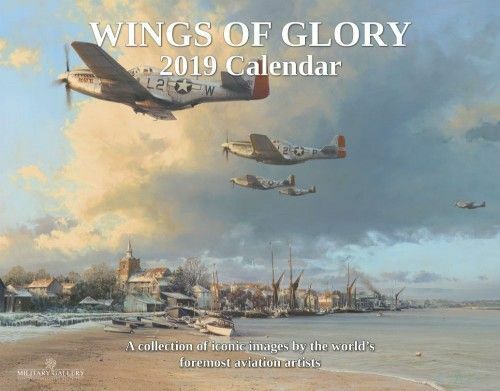 Including images by the world’s most widely collected Aviation and Military artists, Robert Taylor, Anthony Saunders and Richard Taylor. FASCINATING TIMELINE OF THE MAJOR EVENTS OF WWII A detailed reminder of notable events of WWII, all clearly displayed as they occurred. NEVER FORGET AN APPOINTMENT Every date box provides generous space for your own notes and memos. There’s no excuse to miss that important appointment! FEATURES A FULL 2019 YEAR PLANNER Means you can plan weeks or even months in advance.